Why did Samsung play it safe with the Galaxy S5’s processor? Of all the phone manufacturers out there, Samsung seems to have a particular talent for creating an anticlimax. Our first thought when holding the Galaxy S5 was that we’d been through all this before a year ago, with the equally underwhelming launch of the GS4. Our disappointment jibed with the reactions of other bloggers around us at Mobile World Congress and with many readers’ comments on our hands-on article. Folks seemed to forget about the phone after five minutes and switch their attention to Samsung’s new smartwatches, especially the delectable Gear Fit. First impressions aren’t everything, however. A phone’s charm can take a while to sink in, and you only have to look at the Galaxy S3 for proof of that. (I reviewed that handset many moons ago, and must admit that I never expected it to do as well as it did.) As add-ons go, the swipe-based fingerprint scanner and heart rate monitor may not be astounding now that we’ve had the HTC One Max and fitness gadgets like the Withings Pulse, but they might prove their utility in time. Even if they don’t, the GS5 has other redeeming features, such as its 1080p AMOLED display, phase-detection autofocus and basic water resistance, and it comes at just the right time to win over GS3 owners whose contracts are coming to an end. But the anticlimax is there nonetheless, and it most likely stems from a suspicion that Samsung’s vast scale and manufacturing strength isn’t being fully exploited. Like Apple, but unlike most other phone makers, Samsung has control over many different technologies that go into a smartphone, including the memory, display and — most importantly — the processor. It showed us glimpses of this cross-discipline expertise with the global versions of the Galaxy S2 and S3, whose in-house Exynos processors brought extra speed and graphics just when Android needed it, and it did something similar with the big-screened, stylus-equipped Galaxy Note series. But the GS5, like the GS4, seems much less distinctive, and so perhaps what we should be asking is this: Why isn’t Samsung able to muster its in-house resources to create something truly different? And that, at least, is a question we can begin to answer. Not everyone believes in fate, but I do, at least in terms of smartphones. I think that every handset’s destiny is fundamentally determined by its processor. If its processor is unique, a phone can be smarter than any other. But if the processor is shared with rival products, then a phone must come with convincing peripheral features if it’s to have any shot at greatness. Neither Sony nor Nokia have the capability to create unique processors, so they’ve wisely thrown their weight behind useful extras, such as class-leading camera modules and standout design. These companies are limited in the technologies they can create, but the threat of extinction has forced them to integrate their departments and gather together every bit of technology at their disposal. Apple, meanwhile, has spent years working on its A7 chip. This allowed it to make core improvements to all areas of the iPhone 5S: a new 64-bit architecture to boost overall performance with no cost to battery life; a new image signal processor to aid the autofocus and multi-exposure performance of the camera; and a new coprocessor that allows the 5S to work as an effective fitness tracker with no need for a separate accessory. Even when Apple has absorbed inventions from outside, it has either acquired the inventor (as in the case of AuthenTec and its fingerprint scanner) or it has established long-term contracts that give it the freedom to tailor a product to its precise needs (as in the case of Imagination Technologies and its GPU). In the case of the Galaxy S5’s processor, however, Samsung simply went shopping. It made sure to buy the best, in the form of a highly overclocked version of Qualcomm’s Snapdragon 800 chip (called the MSM8974AC or Snapdragon 801), but ultimately this is just a marginally faster version of the chip inside Sony’s Xperia Z2 (the MSM8974AB). In turn, the Z2’s chip is just an overclocked version of the original Snapdragon 800 (MSM8974) found in the Galaxy Note 3, Xperia Z1 and Nexus 5. Samsung’s reliance on Qualcomm made sense with the Galaxy S4 and American versions of the GS3, because these handsets came in the midst of the disruption caused by LTE. The Snapdragon line quickly gained a reputation as the best value, most reliable and most efficient chip for 4G, and the rest of the mobile silicon industry was caught napping by Qualcomm’s adroitness, so it seemed unfair to pick on Samsung’s semiconductor business in particular. But as time has gone on, and other silicon players like MediaTek and Intel have started to catch up with their LTE support, Samsung’s tardiness has become harder to understand; the only way to find out more is to talk to the Exynos people themselves. Far away from the clamor of Samsung Mobile’s main stall at MWC, I came across a quiet section that had been reserved for the component side of Samsung’s business, which incorporates Exynos. 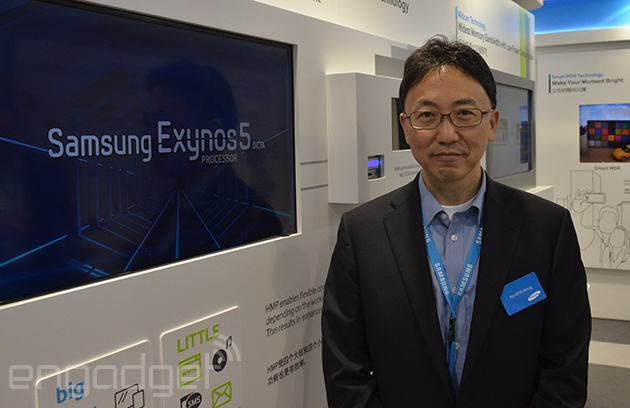 There I met VP Kyushik Hong, from a department called System LSI (LSI stands for “Large Scale Integration”), who gave me a rundown of his team’s latest creation: the Exynos 5422, which will powerAsian variants of the GS5. I should mention that I’ve developed a soft spot for Exynos chips over the years, because they have strong gaming performance and they’ve tended to be accompanied by audio circuitry that does good things for music playback. But the new Exynos takes things further, by adding features that are ripe for integration. The 5422 supports something called “active hibernation,” for example, which can reduce a smartphone’s power consumption by 10 percent by not refreshing pixels on the display except when they need to change — something that only works when the chip is paired with a Samsung-made display panel. For a phone that probably lasts around 10 hours on a charge, even an extra hour of battery life represents a huge improvement, but it’s one that will be absent from Western versions of the GS5. Hong did his best to explain this predicament without getting himself or his colleagues into trouble. He told me that it’s a “misconception” that Exynos-based smartphones are inefficient when it comes to LTE. 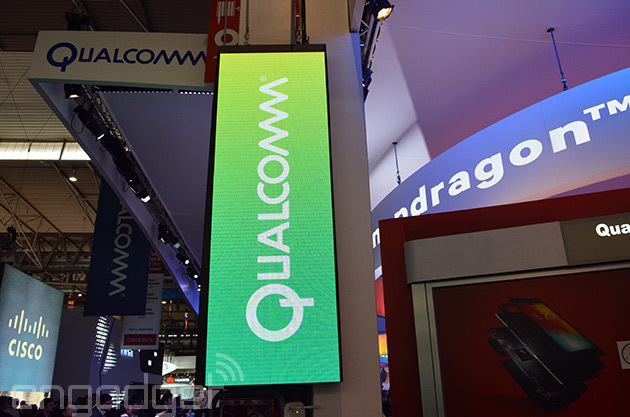 Instead, the reason Samsung Mobile uses Qualcomm’s chips rather than Samsung ones has more to do with price: Snapdragons merge the LTE modem with the main processor, which reduces costs, but also — Hong believes — results in “de-featured” chips. Conversely, Exynos is a “high-end premium” chip that deliberately keeps the modem and processor separate for the sake of performance, even if the higher price is a turnoff to Samsung Mobile. When I asked why Samsung doesn’t enforce cooperation between its mobile and processor arms, for the sake of developing a more integrated device, the head of marketing for Samsung Semiconductor, Thomas Arenz, stepped into the conversation to remind me of a crucial fact: Samsung’s component business can’t engage in any sort of special relationship with Samsung Mobile for fear of losing the trust of other companies that buy Exynos chips or other parts. In other words, it’s about as far as you can get from way Apple’s various departments work together. “It’s not up to us which hardware ends up in which phone,” Arenz said. “There’s no guaranteed mechanism to ensure an Exynos chip ends up in a Galaxy phone. It’s not always a price issue; sometimes it’s an availability issue, but the contract goes to the one who makes the best offer. Do you really need a 4K smartphone screen? 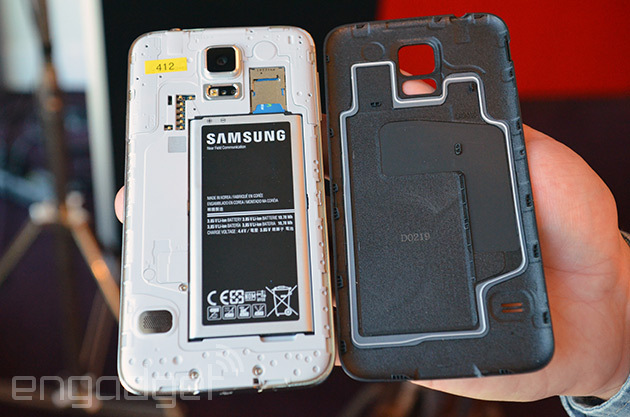 So, why did Samsung play it safe with the Galaxy S5? The first and most obvious answer is that it was incapable of doing anything else, because the entity we call “Samsung” still sees itself as a component maker as much as a phone maker; a conglomerate rather than a unified force. Put differently, the GS5 is made not by Samsung, but by Samsung Mobile: a much smaller organization that is tasked with making the best phone it can using off-the-shelf components. This subsidiary lacks special access to Samsung’s other areas of R&D, which means it has no more clout or control than HTC, Nokia or Sony. According to this view, there’s little scope for change and we should simply temper our expectations before the next phone launch. Another, more speculative answer is that Samsung is working toward better integration, but it needs to solve problems with Exynos first. Work may be in progress to improve yields or reduce costs in its semiconductor business, and perhaps this will lead to a more joined-up, homegrown device at a later date, in the form of the Note 4, GS6 or maybe even the rumored premium edition “Galaxy F.” As to what such a device might offer, beyond what’s currently available, we’re certainly not asking for anything gimmicky, like a beyond-HD panel or 4K video recording. On the contrary, it would just be nice if Samsung could gather up its expertise and produce a subtle but fundamental improvement in battery life, or equally some other useful feature that we didn’t expect and that no other Android manufacturer could have accomplished. Goophone’s a bit like a covers band that just happens to make knock-off smartphones. Not content with just plundering better artists’ catalogs, the company has apparently managed to copy the Galaxy S5 in under two days. The Goophone S5, yep, has a 5-inch, 1,920 x 1,080 display, paired with a 2GHz octa-core MediaTek chip and 2GB RAM. Keep looking, and you’ll find 802.11 b/g/n WiFi, dual-SIM slots, 32GB storage and a 2,800mAh battery, in addition to 13-and-5-megapixel rear and front cameras. It’s available in white, black, gold or blue and is priced at $300, making it the ideal companion for your Lucci bag, Tammy Hilfingershirt and Seanheiser headphones. Samsung has just outed its shiny new Galaxy S5 at Mobile World Congress, but you may be curious how it stacks up against flagships from other outfits. Well folks, we’ve lined it up side-by-side with the Sony Xperia Z2, LG G Pro 2 and HTC One on the other side of the break. While the GS5 and Xperia Z2 appear to be neck and neck, it may come down to those standout features to see which handset gets the edge. Of course, a new HTC flagship is on the way next month, so we’ll have to take stock all over again once the details are revealed. If you’re anxious to see how the GS5 matches up with your current daily driver, you can add in that model and tally the numbers with our Compare tool. Even in an industry known for evolving at an impossibly quick pace, it’s rare for a product to be replaced in just five months. If you’ve read our review of Samsung’s Galaxy Gear smartwatch, however, it probably makes sense why the manufacturer would want to antiquate it as soon as possible — while an interesting concept, the wearable was clearly half-baked. This morning, Samsung is starting off Mobile World Congress by announcing the Gear 2 (shown above, right) and the camera-less Gear 2 Neo (above, left), both of which (the company hopes) will address most of its predecessor’s pain points when it arrives in stores worldwide this April. The absence of Galaxy branding is no typo, by the way; the new Gear will run on the Tizen operating system, a platform which Samsung has been investing large amounts of money and resources into. It’s not the company’s first device running that OS — that honor goes to the NX300M camera — but regardless, it’s hard to know exactly how different the user experience will be on a Tizen-powered smartwatch instead of an Android-based one. According to Samsung, we can expect a battery life of 2-3 days (two to three times better than the first Gear’s one-day life), an “enriched application ecosystem” and some sweeping changes to the external design. Check out the gallery below and join us after the break for more details. Let’s first talk about the design. The first thing we noticed was that the camera is now built into the front of the watch alongside the IR blaster, which is much better than the original Gear’s distracting wart on the wristband. The mic, formerly on the clasp of the strap, has now been moved up to the body of the device itself; this means that Samsung will now let you swap the wristband with either Samsung-specific models or third-party versions. Samsung didn’t elaborate on if this will be compatible with all 22mm straps (similar to Pebble) or if it’s a different spec, but this is nevertheless a splendid improvement over the first Gear. It also features a home button just below the display instead of on the side, like the previous version. With the new pair of Gears, you’ll also get the same 1.63-inch touchscreen, a 1GHz dual-core processor (a bump up from 800MHz), 4GB internal storage, 512MB of RAM, infrared, S Voice, a heart rate sensor, IP67 certification for resistance to water and dust, a 2MP AF camera with 720p video capture (on the higher model, not the Neo) and a 300mAh battery. This means that the battery is technically smaller on the new Gear, but Samsung claims a life of 2-3 days; this is a drastic boost in performance over the original watch, even if the time between charges is still too frequent for many watch users. Lastly, both models will be compatible with “more than dozens” of Galaxy smartphones when it launches. There are only a few slight differences between the Gear 2 and its Neo sibling: the Neo doesn’t have a camera, the Neo offers one different color than the Gear 2 and it’s a tad lighter (the Gear 2 is 68g, whereas the Neo is 55g; both are lighter than the original). Neither model has a price tag to go along with the announcement yet, but we like to see multiple options available at different price points. The top model will come in Charcoal Black, Gold Brown and Wild Orange, while the Neo replaces the Brown for a Mocha Grey hue. We hope to get hands-on time with the watches soon.